Battle of Saint-Eustache. Source: Wikimedia Commons. On 1 December 1837, William Lyon Mackenzie (Toronto’s first, though short-lived, mayor) penned a Declaration of Independence. The political situation in the Canadas had reached a breaking point. 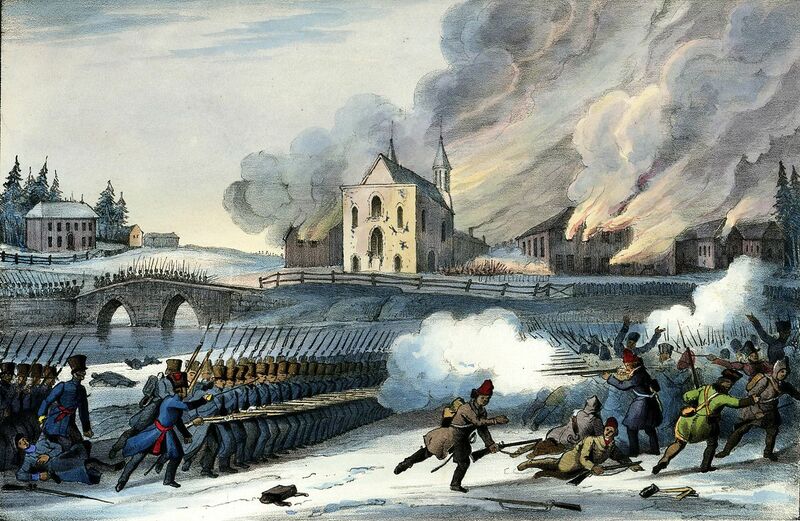 Just a week earlier, on November 23rd and 25th British troops marched on the towns of St. Denis and St. Charles, located along the Richelieu River in Lower Canada. They were charged with arresting the leaders of the growing movement for political reform. At St. Denis, the troops were pushed back by 800 reformers but at St. Charles two days later the reformers were defeated. Mackenzie, fueled by similar sentiments and egged on by the departure of British troops to reinforce Lower Canada, chose to strike while the iron was hot. Just four days after penning his declaration, he and a motley crew of similar minded Upper Canadians marched down Yonge Street in Toronto. They were quickly dispersed by a few shots from the militia and two days later 1,500 militia men marched on their meeting place at Montgomery’s tavern. Known as the Rebellions of 1837 and 1838, the events in Lower and Upper Canada were one of the few moments in Canadian history where wide-spread grievances led to mass violence. Francophones and Anglophones divided not just by language and religion but also by hundreds of kilometers had nearly simultaneously taken up arms against the state. What on earth could have led to this outburst of violence? What was wrong with political life in Lower and Upper Canada? In this chapter, we will look at two documents that shaped the nature of this conflict. In document one, you will read several of the 92 Resolutions demanding political reform sent to Britain by the Lower Canadian Assembly – controlled by the Parti Patriote – in 1834. Document two marks the British response to these demands, formulated into 10 Resolutions by Lord Russell, in the spring of 1837. In the interpretation section you were learn about the aftermath of these events and the complex ways that race and gender shaped the experiences of many of the participants. Jarret Henderson, “Banishment to Bermuda: Gender, Race, Empire, Independence and the Struggle to Abolish Irresponsible Government in Lower Canada” Histoire sociale/Social History, vol. XLVI, no. 92 (Nov 2013): 321-348.